At Koup Family Dental, family is the focus. 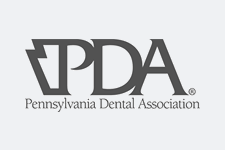 Our dental family has long-time roots in the Paoli, Pennsylvania area and has been treating families here for over 40 years. We believe in treating our patients like family by getting to know each individual and their unique dental needs. Our treatment philosophy is based on long term relationships with our patients to help them maintain their beautiful smile and optimum dental health. We do not treat what is not needed. We offer care and compassion in developing a treatment plan best suited to our patients’ needs and lifestyle. Our highly experienced staff weaves tried and true dental treatment with cutting edge technology to provide the best preventive, restorative, and periodontal care in the area. The confidence of a beautiful smile is important to everyone, and when cosmetic dentistry is needed to preserve that, our team is ready, whether it be teeth whitening or straightening. Technology is always improving, and so are we by implementing new equipment and products to better serve our patients. Our guarantee: From a friendly smile when you walk in to a comforting hand when needed, you will feel welcome. We look forward to meeting you and making you a part of our family! 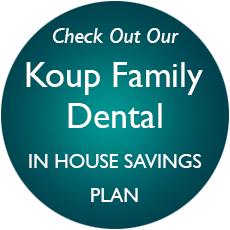 Koup Family Dental is 100% committed to providing our patients with the very best dental care. We hope you would not postpone or suspend dental work due to costs. Please know we will work with you to create a payment plan that fits your budget. We are excited to announce our new In-House Savings Plan as an affordable and comprehensive option for your dental healthcare needs, especially for those without dental insurance. At Koup Family Dental we realize your individual oral health needs deserve personalized solutions. Koup Family Dental Welcomes New Patients! The best time to begin improving your dental health is now. Your dental health, comfort and satisfaction are our top priorities.